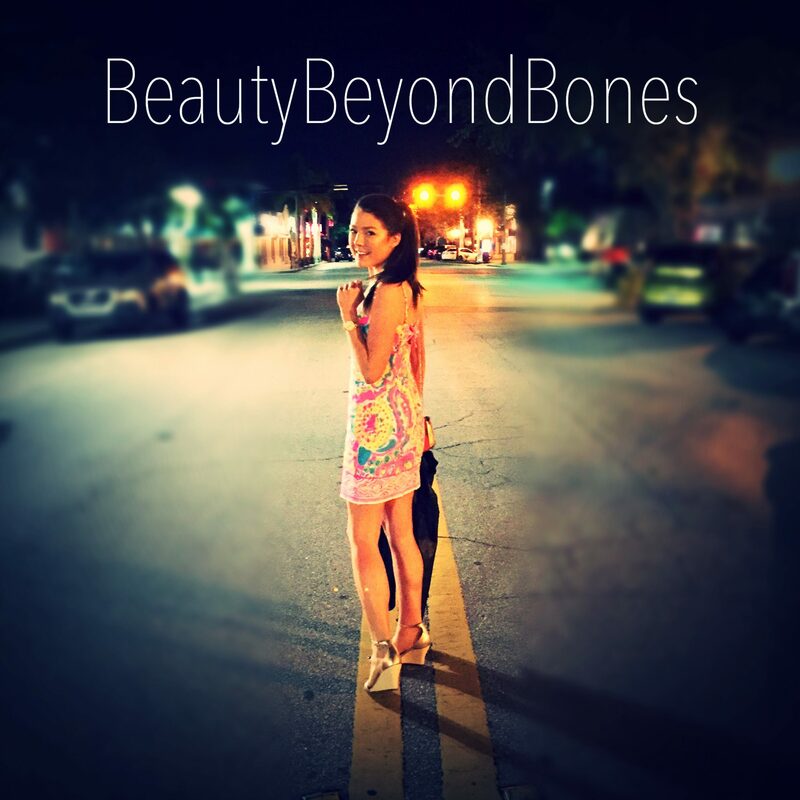 I’m so glad that so many of you have signed on to receive my BeautyBeyondBones Email Newsletter! One of the most exciting aspects of it, are my daily inspirational videos: Oh What a Beautiful Morning! They’re from my heart to yours. So if you want to join in on the fun, you can leave me a comment with your email, or sign up in the box below! So I’m really excited about tonight’s recipe. If you’ve been to the grocery store in the last week or so, you will know that it is squash season. And if you know anything at all about me, then you know that I live for a good butternut squash. I make ice cream out of it, but that’s a story for another day! Tonight, I want to share about one of my favorite, favorite fall recipes. And in fact, this is my go-to recipe for any holiday dinner, or even a dinner party! It is super travel-friendly, and always leaves people a) impressed at your ballin’ cooking skills, and b) desperately trying to snag a bite because it is such a beautiful and delicious dish. My Jewel Stuffed Acorn Squash! 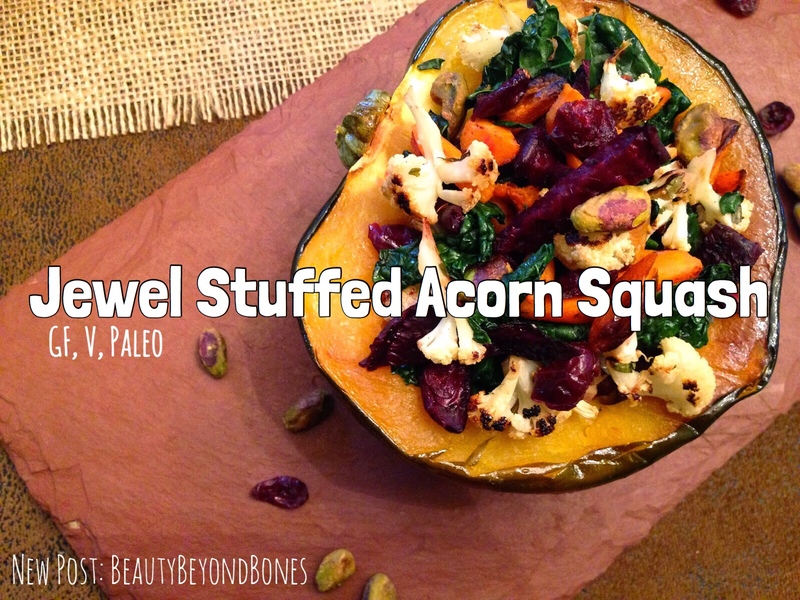 A tender and sweet acorn squash stuffed with earthy sweet, jewel-toned roasted veggies! And it’s grain and gluten free, vegan, Specific Carb Diet friendly, and Paleo! *To see all of my kitchen must-haves, check out my page on Amazon! Preheat oven to 374. Spritz the skin and cut-side of the acorn squash with olive oil or coconut oil. On a tin-foil lined, olive-oil spayed baking sheet ((or simply line with nonstick tinfoil)), place your squash cut-side-down and bake for about 40-45 minutes, until the flesh is tender. On a separate tin foil-lined, olive-oil sprayed baking sheet, place your beet rounds, carrots, and cauliflower florets. Spray with olive of and sprinkle with salt, pepper and tarragon. Roast for about 30 minutes, stirring/flipping once, halfway through. Be sure to watch the carrots carefully so they don’t burn! Meanwhile, sautè the kale in a frying pan in 1 Tbsp EVOO, salt, pepper and tarragon. When the beet rounds come out of the oven, cut them into matchsticks. Combine all the veggies with the cranberries and pistachios. To assemble, fill each squash cavity with a generous scoop of the veggie mixture. Garnish with more cranberries and pistachios if desired. WOW. What a delicious meal this was! It was truly a feast for both the eyes and palate! The acorn squash is a rather sweet vegetable. It is the perfect canvas for the earthy sweet beets and carrots, and the nutty, golden cauliflower. The cranberries provide this bunch of tart sweetness, while the pistachios provide an amazing salty crunch. Try this delicious and healthy treat. You will love not only how it tastes, but also how great it makes you feel! They’re almost sold out! Get your FALL FabFitFun Box! And use my code “FALLINLOVE” to get $10 off! $375 worth of produces for only $39.99! Bluestone Sun Shields are recommended by top dermatologists for their superior sun protection. Their visors offer 99% UVA and UVB blockage. Chic, discreet sun protection. Here, in Finland already morning has arrived (right now 07:32) – then for you a night with pleasant dreams in remembrance of Jesus Christ. This looks like the perfect recipe to have in the autumn time! Last year I was on such a squash kick. Thank you! Think I am going to go log off and get the stuff to make this for dinner. Yummy. The presentation is so beautiful!! Great post. It looks amazing, I wish I could taste it.